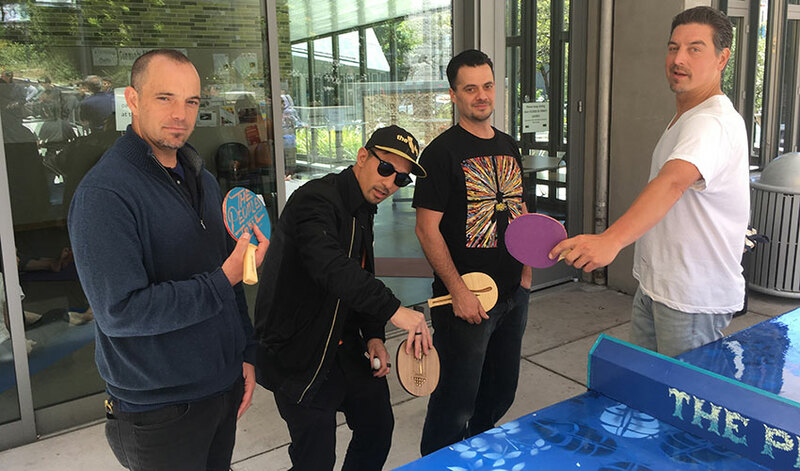 SF State student Galen Maloney and artists Andy Co, Dominic Fontana and Joaquin Sorro take a break from a recent ping-pong game at San Francisco’s Boeddeker Park. Maloney recently was selected to join the San Francisco Bay Area Albert Schweitzer Fellowship class of 2017. He’ll use the award to install another ping-pong table, bringing more engagement and play to the neighborhood. Near the corner of Eddy and Jones in San Francisco’s Tenderloin neighborhood is the entrance to Boeddeker Park, a recently revamped public space with a basketball court, a swing set, an area for tai chi practitioners and a glass-walled clubhouse. And since February, the park has also featured an outdoor ping-pong table, a work of art in itself, completed by local artists and designers as part of "The People's Table" collaborative. The project manager and one of the founders, Galen Maloney, is pursuing a master’s degree in public health at San Francisco State University’s College of Health and Social Sciences. Maloney has been interested in finding ways to promote community engagement and play in outdoor public areas since spending time in Europe, where ping-pong tables can be found in cities like Barcelona and Berlin. The table has inspired interactions between old and young, non-English speakers and native speakers and others who wouldn’t normally connect — which is the whole idea. Now, thanks to a $2,000 Albert Schweitzer Fellowship award, he’ll get a chance to facilitate the installation of another table, hopefully somewhere along Market Street, where people of all walks of life can benefit and access it. Maloney was selected last month to join the San Francisco Bay Area Albert Schweitzer Fellowship class of 2017. The program seeks to develop a pipeline of emerging professionals to give them the skills to address unmet health needs. Maloney says he’ll use the award to cover the cost of materials of another table as well as the permit fees associated with installation. Installing play objects like ping-pong tables, climbing walls or chess tables can change the dynamics of a community, and can give people a chance to lower their stress levels, he said. That’s especially important in a neighborhood like the Tenderloin, where evidence of poverty and homelessness can be seen on just about any sidewalk. Rama Ali Kased, a lecturer in health education at SF State who is Maloney’s faculty adviser on the project, says Maloney has thought a lot about how to address the well-being of a community. “He’s always looking around in public places, particularly in San Francisco, to see how space can be better used,” she said. Maloney says he’s eyeing the sunken Hallidie Plaza at the Powell Street BART station for the next ping-pong table. He plans to work with the same three artist friends who make up "The People's Table" collaborative — Joaquin Sorro, Dominic Fontana and Andy Co — all of whom grew up in San Francisco and have known each other for several decades. The table at Boeddeker Park is made of sheet metal with a concrete base and features bamboo leaves and the words “The People’s Table” painted in yellow across the net area. The base reads “Sanctuary City” — a reference to the city’s traditional welcoming role to immigrants, outcasts and misfits. Maloney said building the ping-pong tables was originally Sorro’s idea. After graduating from SF State, Maloney hopes to continue working in urban design, public health and youth development. “I want to help make cities and public space more accessible, more enjoyable and more beautiful — eventually more just,” he said.